I've always been someone who just can't sit still. I have to be doing something. Most of the time I'm reading, but over the years I've tried cross stitch, scrapbooking, and sewing. Recently, I've fallen in love with crochet. From Wikipedia: Crochet is a process of creating fabric from yarn or thread using a crochet hook. The word is derived from the Middle French word croc or croche, meaning hook. Crocheting, similar to knitting, consists of pulling loops of yarn through other loops. Crochet differs from knitting in that only one loop is active at one time (the sole exception being Tunisian crochet), and that a crochet hook is used instead of knitting needles. I love that I can make beautiful and cozy things in a relatively short amount of time. There are so many things you can make, not just afghans (though I've made a few of them) and with the variety of yarn available, you can really get creative. The projects I've made have included hats, scarves and gloves for friends, baby booties for a new niece, toys for friends' kids and a variety of items for my Etsy shop. I like trying out new patterns, even if I have no idea what I'm going to do with the finished product. I just finished a scarflette for my Etsy team contest and am working on my first pair of socks for Dewey's Knit-a-Long for myself. 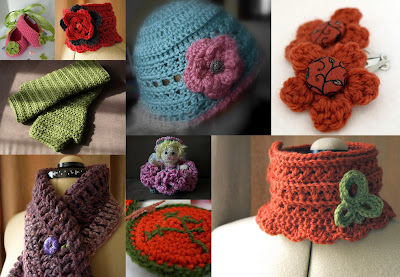 *Websites: Crochet Me has a variety of free patterns from members. Ravelry (requires members to sign up and there is a short waiting list) is sort of like LibraryThing. You can catalogue your projects finished and in progress, books and patterns, plus browse other members pages. *Books: I don't have many crochet books; I find a lot of patterns online but I do love the projects in Essential Crochet: Create 30 Irresistible Projects with a Few Basic Stitches . I also like the projects in Crochet Today magazine. *Other Crocheters: I admire Nata Jane's talent. She has a real clean and simple style. Fray's scarves are so unique and creative. And of course the members of my Etsy Team are amazingly talented. Check out the team blog. Funny! I came over to look at your book reviews and I find this post on crochet. Everyone else seems to knit. I love crocheting! I've made both of my daughters a baby blanket which has become their lovey. They both still sleep with them. I like to crochet other things too. I like to crochet while I am watching tv. I am participating in Dewey's Knit-a-Long Challenge too. I love to knit and crochet! The only problem is that I am reading a lot less b/c I'm crafting a lot more! :) Your projects are great! I'm a knitter - doing the Dewey Challenge - but I'm eager to learn to crochet too. I already wanted to learn how to knit, but now thanks to you I also want to learn to crochet! Is it easy to learn on your own? I love those projects! It's been a lot of years since I crocheted anything, but seeing your projects makes me want to start back in again! I am in awe of your ability to crochet. I lived with my grandmother and great grandmother all through highschool and they both knit and crochet and sew and paint and NONE of those talents were passed on to me. your things are really lovely! I can't knit or crochet. Your work is lovely. I haven't crocheted in years. You do nice work. My Weekly Geeks post is up. Jenn- So nice to *meet* a fellow crocheter. Julie- I'm finding that too. I'm always behind on one thing or the other. Holistic- I hope you give it a try. Nymeth- I found it much easier to learn than knitting. I only needed a bit of help and with Youtube now, you can see how it's done. Robin- I hope you try it again. Puss- I'm sure it would come back to you. Wow, I love that hat!! I like crochet but never made it past the granny square. It's wonderful to see how much you can do with crochet. I'll definitely have a peek at your etsy shop. Thanks for sharing. I used to crochet once upon a time ago. I was determined to learn when one my cousins crocheted me a penguin, and my aunt (who seems to be able to do any kind of craft involving fabric or yarn) gave in and taught me. Poor aunt -- I wasn't really good at it, but at least I was better at it than knitting! I love your projects! The colours are especially vibrant! 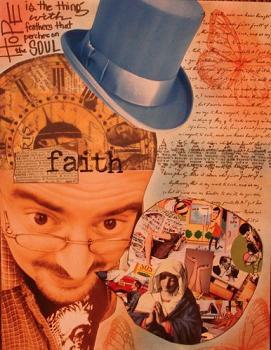 I don't need to partake in any more crafty things - but I will most definitely admire your talents. Woohoo! I am a new knitter and participating in Dewey's Knit A-Long. Did you crochet those adorable baby booties in the montage in your post? I tried to go to your etsy shop, but my screen gave me a page error message. :( I wanted to see what lovely things you have created! those are beautiful!! I would love to learn to crochet. I've tried my hand at knitting and that is fun but I'm not very good at it. Great post!! Yati- Maybe you just weren't ready. Kim- Thanks for telling me. It's fixed now. Yes, I made those booties for my niece. Staci- I'm not very good at knitting either. Wow those are some beautiful projects! I have always admired such crafts as knitting and crocheting, but I have not attempted it myself. I really should though, it looks like fun! Thank you so much for those crochet links. I have been wanting to return to this hobby (after years & forgetfulness). It was so much more fun than knitting (in my humble opinion). Great stuff! Beautiful work! My mom is an excellent crocheter and has tried to teach me a couple of times, but I've come to the conclusion that I am the Worst Crocheter Ever. Think I should stick to sewing. It seems like a lot of bloggers like to be creative too. I would crochet too, if mine would turn out like yours. What a great video! I wish I knew how to crochet, I'm going to have to look at those youtube instructions. I love to crochet too, even though I'm not very good at it. I started when I quit smoking, to have something to do with my hands while watching tv. Your stuff is beautiful!! Bogsrider- It tests my patience, believe me. Kim- Give it a shot! Melanie- I do some sewing, but I find that more frustrating. Kristina- Youtube has a lot of great tutorials. Joanna- Congrats on quitting smoking! Crocheting is much better than snacking. Chayenne- You can always come back to it. I have to admit I always wanted to try knitting and such. Sadly, my ADD doesn't allow me to concentrate on such things. Both of my grandmothers could crochet just about anything. I learned a little bit, but I was never very good at keeping my stitches the same size. You crochet some beautiful things. Keep it up!